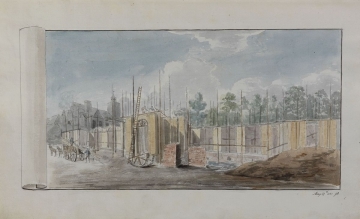 Drawing 84 is the first of a series of construction progress drawings made on site during the summer of 1812 by Soane's pupils. Basevi would have made a rough sketch and then redrawn the view into the record book at the office in Lincoln's Inn Fields. 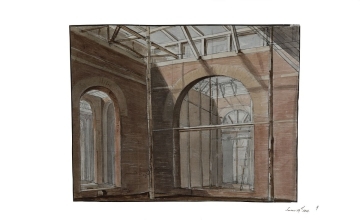 When Basevi copied the drawing he added a scrolled trompe l'oeil effect so that it looked as if it was pasted-in, like most of the other drawings. The Mausoleum and foundations of the almshouses are shown at an early stage of construction. 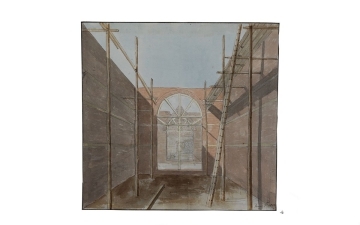 The rest of the progress drawings would have been sketched on site and then pasted into Soane's record book. 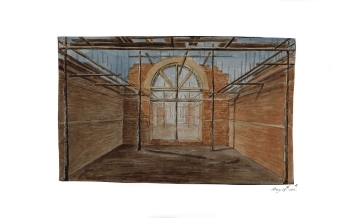 Drawings 85 and 86, drawn a week apart, show the development of the plain round arches of the Gallery enfilade supported by timber scaffolding. The walls were built by the bricklayers John and Henry Lee who were paid a total of £2804.3.3 for their work. London stock bricks were used and 14,550 bricks were required for the Gallery. Drawings 87 and 88 show the erection of the stone lantern above the Mausoleum. 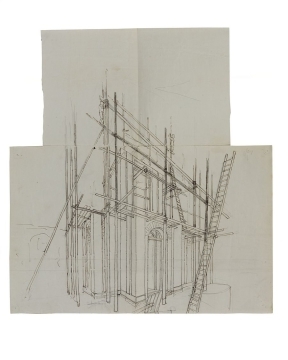 Drawing 87 (not recorded in Nevola's catalogue) is presumably the rough sketch done on site, it is a loose drawing kept in the front pocket of the record book. This was then copied in drawing 88, which was actually pasted into the record book. 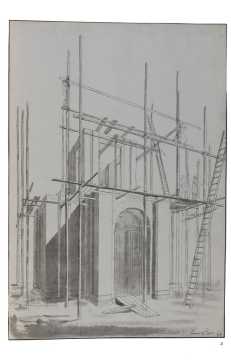 By 3 June the scaffold had been erected for work to begin on the upper storey of the Mausoleum. Thomas Grundy was employed as the stone mason and was paid a total of £1243.6.6 for his work. He had constructed the shell of the lantern, including the urns which were pegged in place with iron, within ten days, as can be seen in drawing 89 dated 13 June. Portland stone was used. He is recorded in the building accounts as having '2 iron bars and letting in 5 Portland Vases'. A few days later the sarcophagi had been added to the Mausoleum as seen in drawing 90 dated 18 June. The second-storey of the almshouses was also under construction at this stage. 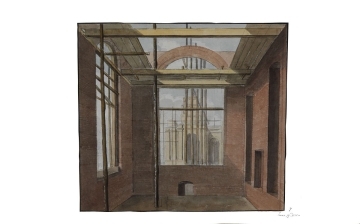 Drawing 92 is a view of the central Gallery room with the arch on the left leading to the Mausoleum and the arch on the right as part of the Gallery enfilade. The roof carpentry is visible. Pupils were sent to the site in pairs, so Chantrell and Basevi would have gone together on 3 and 29 June. 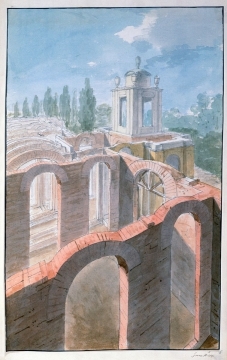 An enlarged version of drawing 92 was drawn by a pupil as an illustration for Soane's twelfth Royal Academy lecture from the second series about construction on 12 March 1815 (SM 15/2/09). 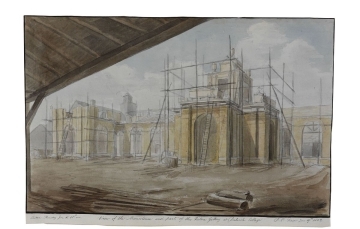 The drawing is of an almost identical view through the enfilade at the same stage of construction but reveals more of the roof carpentry and is drawn in greater detail. The information about the tradesmen is from the building accounts, SM Bill Book G, folios 413-442.